I named the socks 'Herringbone Lace' and the wonderful Lorna's folks are taking their knit up version to The National NeedleArts Association where lots and lots of people will see them. I can't wait to see which colors they choose to knit them in. Now this may all seem a bit silly to anyone who may be reading this, BUT my wonderful friend and knitting mentor, Allison Judge, and I started 2 Askew Designs late last year and this is priceless publicity! 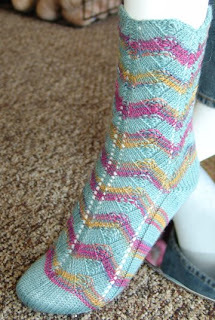 whose infinite dabbling in the paint pots is the inspiration for these socks and many of my other creations. I am currently working on an elegant shawl in one of the Limited Edition colorways (Becca's Last Day) in Lion and Lamb. OOOOhhhhhhh yummy silk blend, in a worsted weight yarn. Anyway, I am a bit excited, and humbled. I am new to design and well, to be recognized by such amazing artists is quite nice. Thanks you Lorna's!